A few years ago, frying in deep fryers was the rage. People were frying everything from Thanksgiving turkeys to whole chickens, to even squash and, believe it or not, ice cream. We've looked at lots of recipes, but we think this is the best recipe we have found for frying ice cream at home. Best of all, you get to choose the flavor. Instant pancake mix -- the type where you just add water. With these bits in hand, you are ready to begin the real work. This is something that takes patience, so be ready to savor all the work you do because it will take at least a day or more before you are ready to go. Take a medium sauce pan and add 6 to 8 cups of canola oil or about 3 inches. Use the frying thermometer to make sure it gets to 365 degrees. Provide several types of garnish -- caramel, fudge, strawberry, coffee -- and serve. That proves you can deep fry anything, including ice cream and enjoy it. Whoever said you couldn't fry ice cream really didn't know what he or she was talking about. 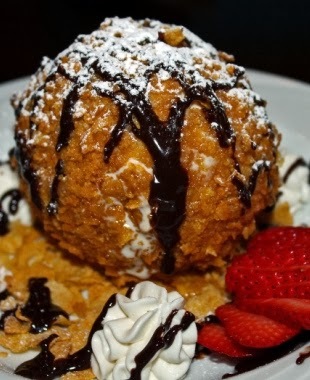 We found what has to be the best fried-ice cream recipe on http://www.bestyummyrecipes.com. This is a great resource for the adventurous cook who really doesn't have time to take all day to do things.